I have just come across yet more insightful research from our Google friends, which the advertising types amongst us will no doubt find useful. This time the research focuses on mobile searches – specifically, mobile user search behaviours and the correlation of mobile searches with online and offline conversions. You can view the full Mobile Search Moments study here – for now, I just wanted to point out a couple of striking stats. First – their research shows that a staggering 77% of mobile searches happen at home or work (i.e. a location likely to have a PC), with only 17% on the go. This surprised me at first as I had thought until now that smartphones were used for searching mainly on the move (i.e. when no PC is available). Then I remembered my own behavior at home: since trading my old phone for an iPhone 5, my smartphone has fast become my #1 device of choice for initiating all sort of activities from the comfort of my sofa including checking emails, reading online articles, playing games and … searching. The study goes on by explaining that the key reason for users preferring their mobile phone over a tablet or PC when searching at home is the convenience and speed it offers. A respondent explains: “It was easier on the mobile device as I didn’t have to get up to turn on the computer and wait for it to boot up”. I could indeed have said this myself to justify my own behavior. 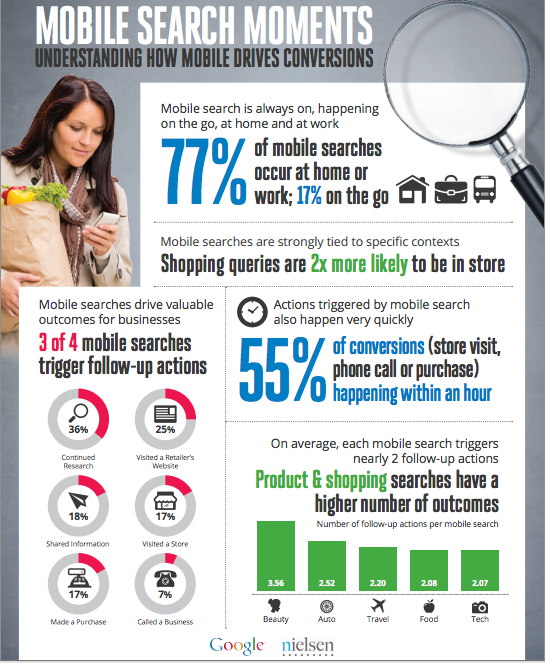 Not only 3 out of 4 mobile searches trigger follow up actions (e.g. visiting a retailer’s site, sharing the info you have found etc. ), but also – and most importantly – 55% of purchase-related conversions (i.e. store visit, phone call or purchase) occur within one hour of the initial mobile search, with that number increasing to 81% within 5 hours. As the ultimate “always on, anywhere anytime’’ companion device, the ever increasing take up of smartphones and with both a purchase intent and conversions this high, it is easy to see why smartphone users need to be at the top of any marketer’s priority list (sadly not always the case). And for the time-poor amongst us, the below infographic sums up all other key insights for future reference – Thank you Google!